This last Sunday the Curriculum Committee of the C. G. Jung Institute of San Francisco offered an intramural event for members and candidates on Contemporary Issues in Archetypal Theory in which several members and board members presented different perspectives. The concept of “archetype” is an ancient one with roots as far back as Pythagorus, Plato and Aristotle. Goethe took up the concept again in the late 1700's and 1800's, which greatly influenced Carl Jung in the 20th century. My thoughts were nourished by these presentations and discussions, which also reminded me of an experience of last April 2013. My husband Donald and I visited the Bilbao Guggenheim Museum, Spain, drawn mainly by its fame. The structure was designed by Canadian-American architect Frank Gehry and first opened in October 1997. Its photographs do not do it justice. Neither Donald, an architect himself, nor I expected to be particularly impressed. 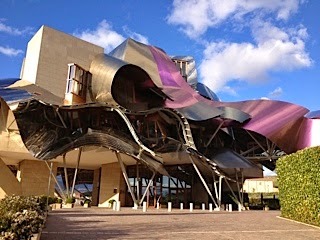 Nevertheless, we decided to visit such an acclaimed architectural feat and to splurge the night before by staying in another Gehry designed building, Marqués de Riscal Hotel, in the nearby village of Elciego. Upon arriving at the hotel, we realized that we were in for an experience beyond anything we expected. The photos of the hotel give an impression of a building that looks like a wad of paper. In person, though, the space is transformative. One cannot assume anything about what is going to be experienced next. Our gently angular room was in the front of the hotel overlooking the entry, with a large wall of windows opening toward the vineyards and village nearly. In the morning we awoke to the sun rising into our sheltered space, the curve of the roof feeling very much like that of an egg. One was hatched into the new day! The museum was a public expression of this experience. What I thought would be silly, in fact, stretched my imagination with potentialities. Through these structures, we accessed essence of space, the archetypal rendering of what contains and shapes us. I wonder, if in ripping away the common assumptions about what living and/or public space is, we experience something much more prime, and, as a result, we are renewed. Isn’t that what healing is? Being reconnected with the gods, in this case, the gods of space? I suspect this is what happens in analysis. When it goes well, we do not enact archetypal processes, such as mother/child, or father/child, but actually hold the space in which these feelings and often unconscious complexes stemming from archetypal processes, visit the analytic container consciously. Through this, they are rendered to their essence and transform. What we experience is in fact a process, if we take Goethe at his word. If we are to know the essence of something, Goethe says, we must hold all aspects of it at the same time. Then we may know the Spirit of it. This is true if we are talking about the essence of a plant or the essence of a human being. Is healing ourselves or our relationships with each other, or the earth, about reconnection with Spirit? What is your own experience? This is a brilliant depth psychological narrative, Patricia. Thanks so much for sharing!